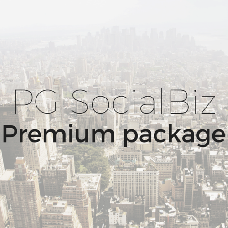 SocialBiz Premium package is the exclusive deal from PG SocialBiz. Everything you need to start a social network online except maybe the domain name for your future website. And we can help you with that too! Premium package by PG SocialBiz is the best choice for people who value their time and efforts. View the detailed list of the product modules that are included with the Premium package on the packages comparison page. Premium customer will be assigned a personal manager who they can contact by phone, email, in live chat and in helpdesk. A perfect way of making one's site unique to excite visitors with the look and feel of the website and to keep them coming back. Dedicated customization team will help tailor the site to your specific requirements. The scope of work may include functional changes as well as API integrations. Hosting for 6 months with 10 GB disk storage on a server that is 100% compatible with the PG SocialBiz script. In case you already have a hosting account that is compatible with SocialBiz, the hosting fee can be recalculated to custom modifications or design changes. Free corrections in the code in case of any third-party-initiated changes that result in product malfunctions. Getting the site back to its original functionality, no matter how long it takes. 5. You will also get a special landing page where people will be able to learn more about your mobile applications and download them. Find out more about the PG SocialBiz script features. With a single purchase, you get the social network where everything works and feels the way you want it to. You come to us with an idea, and we make it come to life for you.